The Springbank is part of my ongoing fascination with Campbeltown whiskies. For no particular reason I am just fascinated by this region. It's like having a love affair with someone difficult. You are crushed when they fail you but their triumphs fill you with delight. While this 18 year old does not exactly set the night on fire it is a beautiful whisky with a unique earthy quality. Lightly peated with a touch of smoke the nose is dominated by wild red berries sprinkled with salt. The sherry influence is warm and earthy giving it a peculiar dusty quality. And finally there is that musky aftershave. I wouldn't mind splashing this one on after a morning shave. Quite a strong oily mouthfeel - confident without overpowering. The earthy sherry is back and it brings with it the berries. Then some figs and raisins with a sprinkle of all-spice. The finish is oily too with that familiar earthiness and musky overtones. Wait. Scratch that. I get Coca Cola. I swear. Another subtly unique gem from C'town. 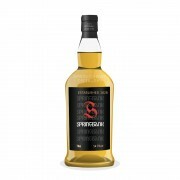 Springbank 18 Year Old Play That Funky Music . . . No, please do! Brilliant! I tried the 15YO Springbank this year, with the 18YO on the horizon for next year. This review might just have tipped the balance and sent the 18 to the top of my targets. Cheers! @Nemesis101 thanks for taking the time out to read my review. I'm glad I could tip this expression for you. This one also oxidizes rather well - becomes more crisp as time goes one. Definite one to have in your cabinet! BTW what's your favorite C'town whisky? My favourite is probably the Springbank 15. It just had a bit of everything that I like without being complicated and fancy. Others I've tried include Longrow Burgundy cask which was very interesting and complex but perhaps overly done. Recently tried Kilkerran WIP which was great for the price, but needs a few more years in the cask. I did try a Signatory Glen Scotia many years ago but was not impressed with it. It might be a distillery to give another chance soon.